On her breakout role in Maren Ade's celebrated comedy. Towards the end of Maren Ade’s “Toni Erdmann,” Ines (Sandra Hüller) finds herself stuck. In one sense, this is nothing new as you’ve spent much of the film watching the fiercely efficient business executive endure the kind of mildly belittling and sexist remarks that she’s well aware is likely indicative of why she hasn’t moved up even further in the world in her professional life, while her personal life has been hijacked by the arrival of her father Winfried (Peter Simonischek), who has been nudged by the death of his dog to rekindle his relationship with his daughter in the only way he knows how – by sneaking up on her in Romania where she’s stationed and attempt to charm her with goofy fake teeth and whoopee cushions under the guise of a made-up character named Toni Erdmann. Still, the metaphor is made literal in the form of a white body-hugging dress that Ines puts on for a party, and in a bit of slapstick comedy that Buster Keaton would be in awe of, Ines’ struggle to writhe out of the super tight frock is alternately as horrifyingly awkward and glorious as if she were a butterfly emerging from a cocoon. Apparently, the only thing more difficult than making a square peg go into a round hole these days is making it look like it’s a square peg in the first place, which may go a long way towards explaining how “Toni Erdmann,” a nearly three-hour German comedy, has become an international sensation since its premiere at Cannes last year. Precisely calibrated but difficult to describe, Ade’s third feature plucks the peculiarities out of family relationships and corporate culture to present a fiendishly brilliant portrait of a woman coming into her own. And like every other choice made by the writer/director in fashioning a film that allows for big comic set-pieces and moments of deeply personal introspection for its characters, the casting of Hüller, whose sharp features and intense gaze gives any hint of an expression beyond utter seriousness considerable power, is inspired. As the film launches its charm offensive on America, Hüller spoke of working Ade, finding her way into a character she initially didn’t connect with, and how in a film full of outrageous moments, it was Ines’ business presentation to her corporate clients that gave her the most sleepless nights. I was always interested in Maren’s work and I was very interested in her as a person as well because she’s an amazing woman. When she sent me the script, I was really excited, but at the same time, I was really scared because it’s such a complex story and such a difficult character. She’s not someone you like in the first place, and I always try to find something in the character that I love and that I would make people love the same way that I love it. The casting went well — it was always a combination of casting between the father and a daughter, so I met a few fathers and Peter Simonischek, I think, met a few daughters, and I think we were the last couple that she tried — and then we found out we really wanted to work together, but my first reaction was I don’t know if this is going to be possible. Ines is really far away from my own life experience and from my own approach to problems and to my family, so I really had to find a way to get familiar with this. What was it eventually that helped you find your way into the character? Well, sometimes things or people are closer [to you] than you think. That’s what I realized because I come from a family of very strong women who did their own thing all the time. My great grandmother raised two daughters during World War II alone because her husband was in war. It’s a strange comparison, I know, but I was taught that sometimes you just have to go through things that are hard, and when we meet Ines, she has different problems than what I just described, but this decision that she makes just to go for what she wants, no matter what, I really admired. It gets complicated when the father shows up, but at the same time, why should she change anything just because he’s there? It’s her life, it’s his decision that he just came there – he didn’t say anything before and he cannot expect her to be the nice, cozy little daughter that he’s missing and wants to have back. So I liked this uncompromising way of doing her thing. I like that she’s not sentimental at all and I also liked her sense of humor that she can use if she wants to, because she has one, but sometimes it just doesn’t fit. That’s what I got to like. You usually work with heavier material. Did you approach this any differently? It wasn’t sold to me as a comedy and nobody ever thought it would ever be. It was a film about a really difficult relationship of two people in very strange situations that might be funny at the end, but we never worked on any funniness. We always worked on the desperation of the people and the needs that they have – what they want and they don’t get and the silences and the things that are not said. Peter and I were lucky to find a connection that is probably really old, but I couldn’t say there was another approach. Maybe the difference was that I had to find out so much about this corporate world that I wasn’t familiar with at all. I took benefit in Maren’s research that she did for a very long time — [for] two or three years, she did a lot of interviews with women in this job in Romania. I’m not someone who likes to [research]. I like my imagination and I always know that I’m making a movie — it’s an invention, anyway, but this time, it was different. I had to learn a lot of practical things. Given the number of awkward moments, I was surprised to hear that the business presentation might’ve actually been the most difficult scene for you. Is that true? Strange as it appears, yeah, because if I weren’t able to do this right, the whole construction would’ve completely crashed and also that she defends her job so hard towards her father would’ve been so stupid if she hadn’t been good at it, so that was a core thing. At the same time, I probably got to the biggest fear of Ines – because it’s hers – that she’s not doing it good enough. I don’t have this fear, or not [as] much because I think you can only do [something] as well as you can. I’m not this eager to be perfect. The craziest days were the outside days at night with a lot of extras. There was a lot of organization going on and a lot of choreography [where] you have to be so disciplined. It’s so much easier to do a naked scene in an apartment for three days with sometimes not more than two people in the room. That’s really easy to do [compared] with a party scene in a real discotheque. Maren Ade is said to do a lot of takes – was it helpful to you? Everybody who looks at things really curiously, really detailed and really exact is interesting — it’s more interesting than finishing a scene just because you have to be finished at so and so o’clock, you know? The amount of rehearsals is unusual in Germany, and Peter and I are used to this process to find things through failure, throwing away things because they are not good. Normally, we don’t have that in film. You go to the set and everything has to be there and there’s not really an alternative. And I don’t believe this is true because there’s always an alternative. You can always do it in a completely different way and this is what [Maren] tried during the shooting. She’s doing so many takes because she always thinks there’s maybe another way of playing this thing. Maybe everybody’s angry now, maybe they really fight, maybe they don’t talk at all. What you see in the film is just one version we did, so there were a lot bigger versions and a lot smaller versions. Was it easy to keep the spontaneity up on a set like that? Yes, of course. I think [Maren] doesn’t like when things go automatically without any tension. She really likes to discover new things and [for] us to discover new things, but she’s just collecting material for the editing process because she wants to have as many possibilities as possible. There are a few scenes where you look genuinely startled – likely that’s just great acting, but were there little tricks that might be sprung on you to get an authentic reaction? There’s a wonderful scene at a bar where you first meet Toni. No, Maren reminded me every take. It was early in the morning because we were shooting the first entrance of Toni all night and we started on [Peter’s side of the scene], then you get tired, so she always told me that I should remember that I’m seeing this for the first time. We had a rehearsing process of one year at that point, so of course I knew what would happen [with Toni]. Sometimes [Maren] played tricks and gave people props to wake people up or surprise the other, but I don’t know if the reactions are in the film. For example, she gave Hadewych Minis a big prop — a big plastic ear — that she put on that was totally unexpected and I had to play the complete scene. I was laughing and crying at the same time, but she didn’t stop the camera and that was kind of [Maren’s] way of telling me not to fall asleep and not to give up so easily. Also, the cat glasses Peter is wearing when he wakes [Ines] up, I didn’t see it in the shot because if he had that on, I couldn’t have stayed serious, so she took those away for Ines looking at Winifred and she gave it to him when I was sleeping. What was it like when you first saw the film? I loved it. I saw it at a theater one week before Cannes and it was really nice of the company to show us before it premiered at Cannes because I think I would’ve had a heart attack. It was so exciting. We were surprised. We didn’t know what kind of film it would be. We had heard about the length of the film and Maren sometimes told us in between what was cut out and what stayed in. But I really liked the experience of being dragged into the story — there’s nothing you can do against it. I heard people had wanted to see just 10 minutes because they had to present the film and then they stayed and saw it again and again because they just hadn’t gotten out of the movie. I had the same feeling. I really liked that. 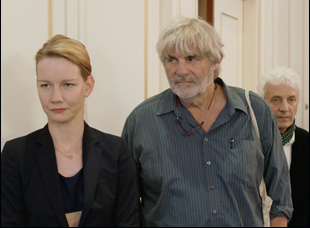 “Toni Erdmann” is now in theaters. A full list of theaters and dates is here. Interview: Dan Krauss on the Difficult Decisions Behind "Extremis"
Interview: Marcel Mettelsiefen on the Arduous Journey to "Watani: My Homeland"